No kidding! 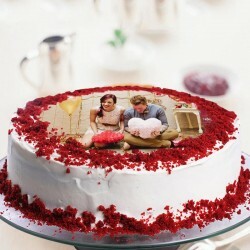 We sell Red velvet cakes too. So what are you waiting for? 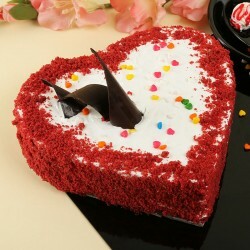 Shop for this bestselling delicacy and give a stunning surprise to your loved ones. 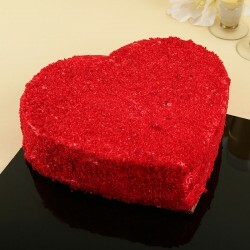 The moment your special ones open this irresistible cake box, it will surely take their breath away. Order online and get it delivered for a sweet, sugary indulgence. Having started humbly, the status that these cakes have attained is overwhelming. They are believed to have been first conceived towards the 1800s when cooks in America were still involved in the struggle of perfecting the cakes that they made. They made use of cornstarch, cocoa, almond flour, to soften the flour protein to attain a softer, finer texture for their cakes. The outcome was finely tagged 'velvet' owing to its velvety feel. As the years passed these cakes went on to be known by various names, like mahogany cakes, devil food cake, sister cakes, and so on. It was only towards the 1930s that these cakes made their newspaper debut in the Midwest and along the West Coast, dubbed as the Christmas cakes. 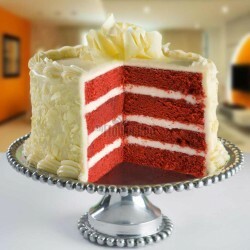 As per an urban legend, the first modern red velvet cake was served at the Waldorf Astoria hotel and later on went to appear at Toronto's Eaton department store. 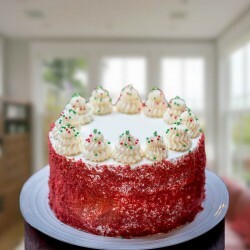 From being commercialized to being the 'star item' on the menu of popular patisseries and hotels around the world, red velvets cakes have had a very fascinating development. 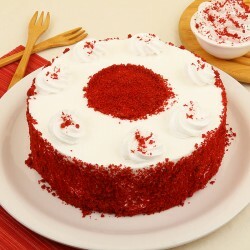 Although the red velvet cakes have been around since the 19th century, they took over the US food market only during the Great Depression. In 1938, The Congress had passed a Food, Drug and Cosmetic Act, setting regulations on food coloring. Meanwhile JohnA. Adams, the owner of food-dye and extract business, Adam Extract Company in Justin, Texas, had an idea that a red cake could actually help him sell more dyes. The company then somehow tricked a mahogany cake recipe which they printed on a card and began selling it with bottles of red dye, vanilla, and artificial butter flavoring (another popular outcome of rationing on food, this time butter during the World War II). The recipe also included the formula of a rich and fluffy icing made of flour, milk, sugar and butter and known as the boiled-milk frosting or ermine. The supermarket recipe soon gained a lot of fame and found a place across kitchens in the Texan homes, later advancing towards South. 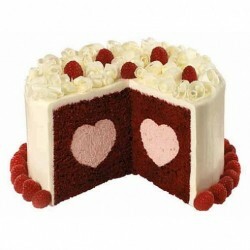 Red velvet cakes have become an inseparable part of the Emancipation Day/Juneteenth celebration, since consuming red colored food is a ritual. 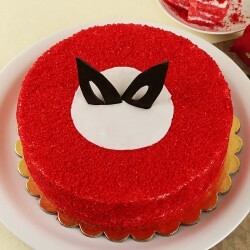 The appearance of a red velvet armadillo's groom cake in the movie 'Steel Magnolias' in 1989 also sparked the popularity of these cakes. 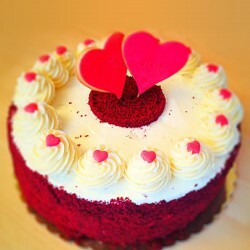 The arrival of the Magnolia Bakery in 1996 in the West Village of New York City breathed new life into the business of red velvet cakes. 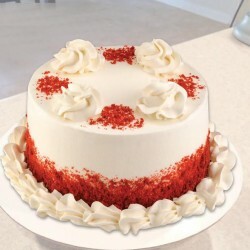 In 2000, Raven Dennis, the owner of Cake Man Raven bakery in Brooklyn, is known to have baked red velvet cakes for celebrities and pre-hipsters. 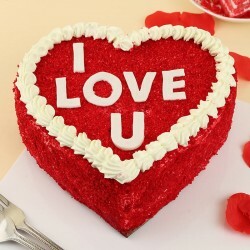 The popularity of these cakes led to a culture of 'red velvet-ization', the result of which can be seen in the form of red velvet cupcakes, red velvet pop tarts, red velvet wine, red velvet mist, red velvet lotion, red velvet lip balm and also red velvet fried chicken. 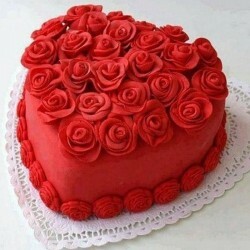 MyFlowerTree is an online one-stop shop for cakes, flowers, cards and gifts, operating across a sea of408 cities within India. Dedicated towards making your special events even better, we bring to you freshly baked exotic red velvet cakes in a wide price range. 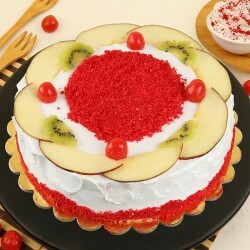 While you can order red velvet cake online at any time, because of their gorgeous red color, they aptly suit occasions like birthdays,Christmas and Valentine's Day. Whether You've ordered red velvet cake in Bangalore or Gurgaon, rest assured as we'll get them delivered to your doorstep in time. Popular among our patrons for our express delivery, we also have same day and midnight delivery options; in other words, the time of delivery is never a constraint with MyFlowerTree!